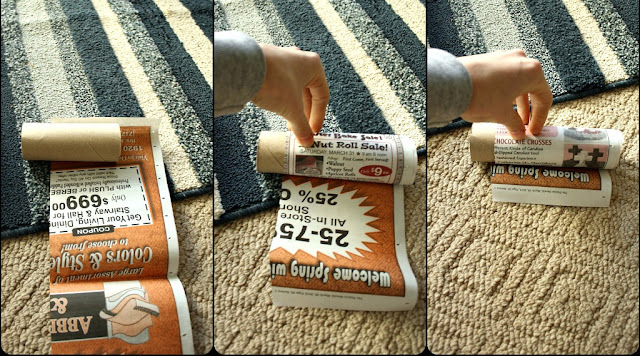 Simply DIY 2: Get Your Newspaper...Pots, That Is ! I finally finished tearing up the patio enough to make a raised garden bed. Last year we bought one that links together and just put it on top of the patio - it just didn't work out too well. I think it needed to be deeper. So I pulled up one layer of bricks, stacked the bricks to make a wall, and now I have a garden bed. So I know that I'm a bit late on starting my seeds, but better late than never. 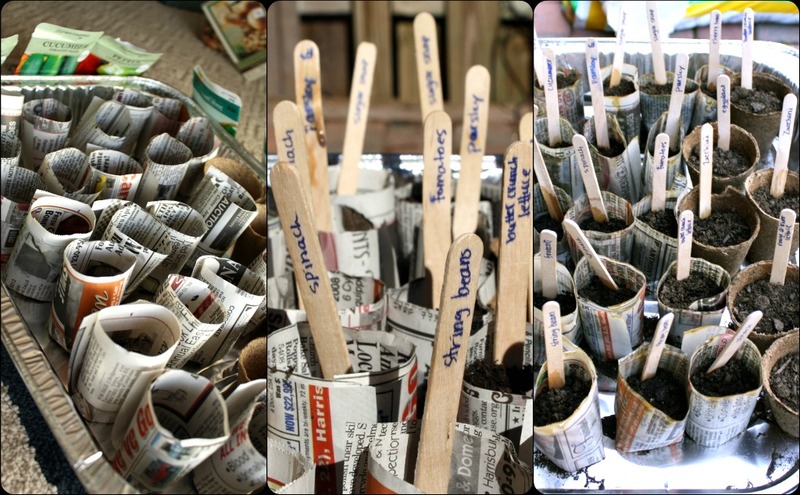 Two years ago my friend had mentioned that she made newspaper pots that can easily be put straight into the ground. So I searched the web and found a video on making them. I didn't want can size pots. I felt that was a bit too big. I thought and then vaguely remembered my friend saying that she used toilet paper tubes to make the pots. I didn't think that it would be much different than the video instructions, so I went with the tube. 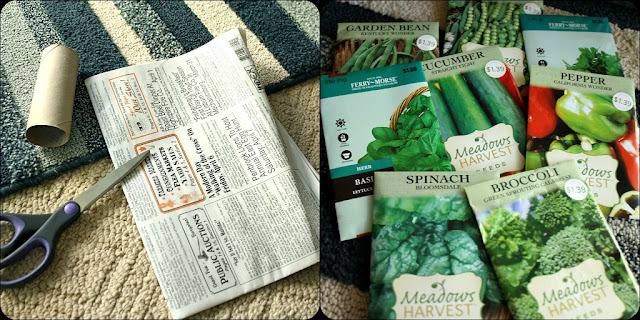 First, I measured and then cut the news paper into 10 X 4 inch strips. 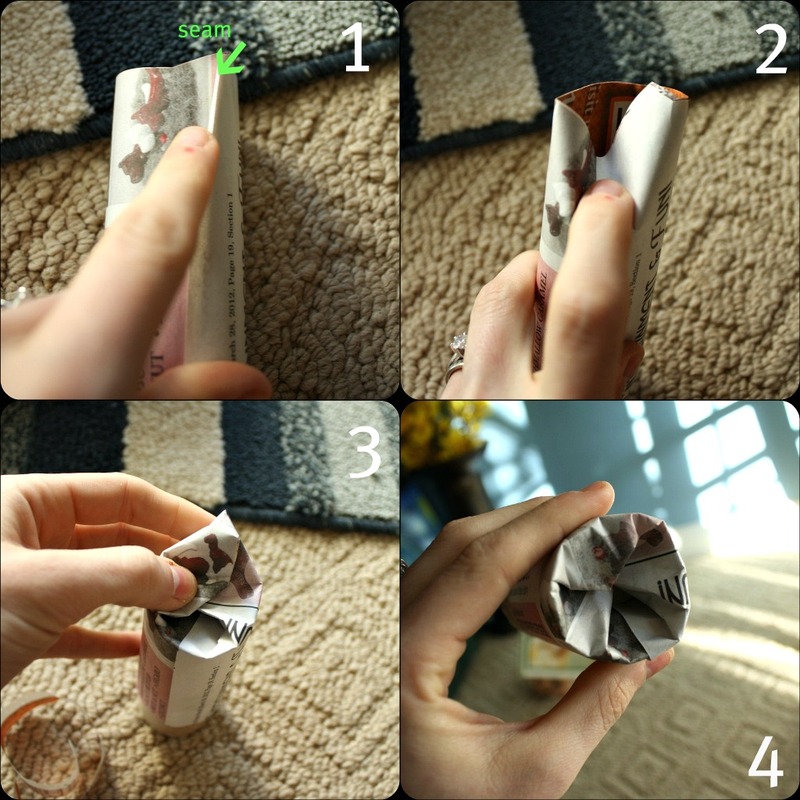 Second, I rolled the newspaper around the tube. Make sure to leave about a 1/2 to 3/4 inch past the bottom of the roll. You'll need this to fold in to make the bottom. Third, I folded the bottom. First, locate where the seam is. You'll want to fold this part down first to help keep it together. Once you fold that part down, fold the opposite side, and then the other two sides. Sometimes I had to cup the bottom and press the tube to help make the bottom stay (that was in the video). I also used my scissors to press down the folded parts from the inside to make sure that it stayed flat. The rest is just planting history: I put the pots in a tin casserole dish, filled them with dirt, put in my seeds, covered with dirt, labeled with popsicle sticks, watered them, and put them in the sun all day. Once it's completely warm enough and the sprouts are big enough, I'll just plant the WHOLE thing into the garden - newspaper pot and all. Can't wait to see the first sprout! How do you start out your seedlings? In peat pots? In eggs? In plastic containers?